The app is currently available to Android users, and services are available in Mumbai and Bangalore. 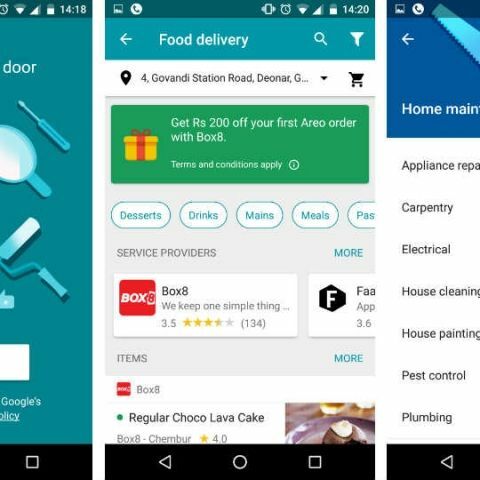 Google has launched a new app called Areo, a food delivery and home services application, which is presently available only on Android, in Bengaluru and Mumbai. The service may extend to other parts of India in the following days. Google has partnered with other hyperlocal app services such as Zimmber, Urbanclap, Faasos, Box8 and Freshmenu, and the Areo app aggregates information available through partner apps to give a unified interface to book, pay and/or schedule certain services. Users can also check out reviews of the available services. However, bigger hyperlocal apps such as Zomato, Swiggy and Foodpanda are not part of the Areo tie up, yet. So far, you can choose between the following menus - Food delivery, Beauty, Home maintenance, Chores and cleaning, Repairs and installation, Fitness and more. Some services such as legal assistance and accounting are listed in the region of Mumbai, but were not available at the moment. Thanks to the unified interface, one can order food from different services into the same cart. Payments are accepted via credit or debit cards, netbanking and cash on delivery. As of now, there are some issues with the app at launch. In one instance, we scheduled a service appointment from Urbanclap and didn't receive any prompt for payment. Even then, the service was scheduled accordingly. When we tried to cancel the appointment, Areo didn't have the option for that. The app will possibly be introduced to more cities and undergo further refinements in the coming days. As of now, you can only avail Google Areo services in Bengaluru and Mumbai.